If you would like to begin hiking and/or camping, but do not feel confident about your abilities, then this book is definitely for you. The author draws on his own six decades of camping and hiking. His parents took him camping for the first time in the high country of Yosemite National Park when he was only a year old. They scooped water from Tenaya Lake (everybody drank from the rivers and lakes back then without any purification techniques) and banged pots and pans to scare away the bears. They continued to take the author and his two brothers camping and hiking every summer of their childhoods. The author and his brothers were also Boy Scouts in troops that camped and hiked during all seasons of the year. They all became Eagle Scouts. This tradition of camping and hiking continued as the author and his wife raised their own four children. Tenting only-no motor homes or RVs in this family! The author's travels have included every state in the United States except Hawaii (an omission that hopefully will be rectified some day! ), six provinces of Canada, and a handful of foreign countries. All of the author's children began hiking and camping while they were still in diapers. They grew up spending many vacations at Yosemite, as well as a number of other national parks. 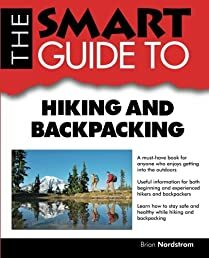 In A Smart Guide to Hiking and Backpacking, the author includes the conventional information about gear, hiking and camping with children, basic first aid, and similar information readers would expect to find in hiking and camping guides. However, the author also includes information about wilderness survival-not only how to avoid unpleasant situations, but more importantly how to deal with them when they do occur-and inevitably they will occur. The Scout motto is "Be prepared.” A Smart Guide to Hiking and Backpacking is intended to prepare readers for their backcountry experiences so that hopefully those experiences will be enjoyable and renewing. The author still hikes and camps every chance he gets. Photography and wildlife observing (especially birding) have become important parts of those experiences. It is the author's sincere desire that readers of A Smart Guide to Hiking and Backpacking will learn to enjoy and appreciate the outdoors as much as he does. The great naturalist John Muir said, "The mountains are calling and I must go.” Hopefully, the mountains are calling you.